I’ve discovered there are two things that people are always impressed to find out that you made from scratch: the first is marshmallows, and the other is crackers. “Oh, my God! I can’t believe you made those! I wouldn’t even know how to start.” I’ve heard it several times, and it always surprises me. I’ve made marshmallows, and they’re a pain. OK, I guess that even I am impressed when someone tells me they made marshmallows (they aren’t overly difficult, just really messy). But crackers? They’re so easy, and these are no exception. We were invited to a Fourth of July barbeque, and I was asked to bring a side to go along with the main course, as well as an appetizer. Well, you can’t have a Fourth of July cookout without potato salad, so that was a no-brainer. But I was stumped about the appetizer, until I remembered The Bottle. It’s just what I’ve always wanted. (Can you hear the sarcasm in my voice? I mean, who wouldn’t want enough seeds to fill a stadium?) So I’ve been hard-pressed to use these things before they go bad – I’ve cooked with them, I’ve filled centerpieces with them, handed them out to children as Halloween treats. You name it, I’ve done it. They’re tasty – but there’s too much. 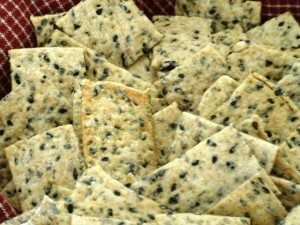 So that’s how the crackers came to contain black sesame seeds. Now, if you don’t have a spouse who cares about you enough to bring you a half-kilo of the black ones, you can certainly use white sesame seeds without any trouble. Actually, I like the visual contrast that the black seeds bring to the table. And the flavor of either is neutral enough that you can pair them with almost any dip or spread that you’d like. I have to tell you, there are two things I absolutely detest when cooking: peeling hardboiled eggs (which is why you’ll never see a deviled egg recipe from me), and rolling out dough. I can never get the dough even. It ends up sticking. If I use parchment or cling wrap, I end up ripping the paper. It drives me crazy. I hate it. So here’s a tip for you: drag out the pasta roller. I use the pasta roller attachment on my stand mixer for this instead of mutilating the dough with a rolling pin, and it eliminates my stress level. The only trick is to make sure you have ample flour on the dough before passing it through the rollers. I knead it 3 or 4 times on the first setting, just like I would for pasta. I then run it through until I’m on setting #3. You can make them thinner, but that thickness worked for me. So the next time you’re feeling a little down on yourself, whip up some of these crackers for someone – they’ll be impressed all to heck, it will stroke your ego, and it’s a lot simpler than those sticky marshmallows. 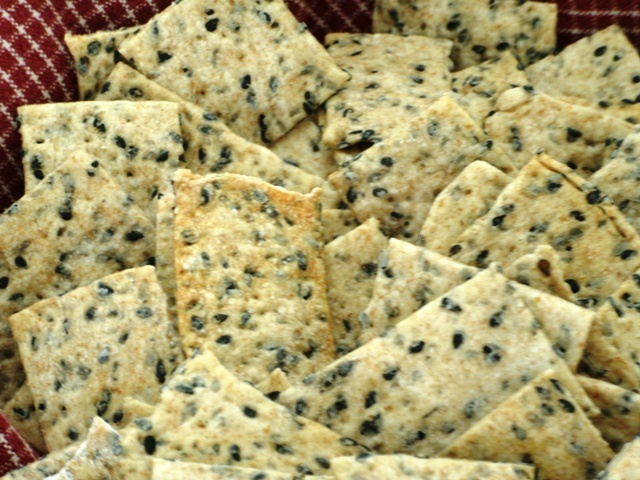 Impress everyone by making your own crackers - no one will know how simple it is! In a large mixing bowl, combine all purpose flour, whole wheat flour, sesame seeds, salt, and pepper. Add oil and about 10 T water to start (3/4 C, less 2 T) mix until combined. Add a little more water if necessary. Turn dough out onto floured board and knead for 60-90 seconds. The dough should not be sticky. Working with one piece at a time, roll dough out until very thin. Dock the dough all over with a fork. Sprinkle with ¼ t of sea salt and press lightly into dough. Cut dough into rectangles approximately 2” x 3”. Transfer to a baking sheet and bake for 6-8 minutes, making sure the crackers don’t get too dark. You can certainly use traditional light sesame seeds. I just think the black ones add some visual interest to the crackers. This post is reblogged from my earlier site, Inexpensive Eating. This entry was posted in Cooking and tagged gift, snack. Bookmark the permalink. From what I had heard from friends who did kitchen remodels, I expected a more painful experience. Deadlines were realistically presented and fulfilled. For a dual working household, we were pleased that we could count on dates, times we needed. And – we love our new kitchen! !